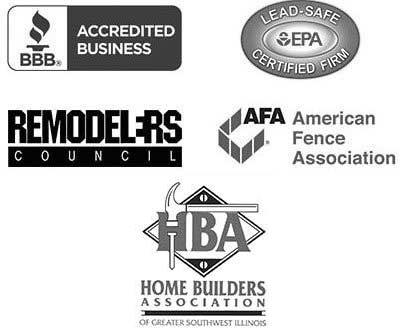 Chelsey Fence & Deck is an experienced deck building specialist serving homeowners throughout the Glen Carbon, Illinois region. Since 1967, we have been installing our premium decking products in any configuration and shape homeowners desire to suit their lifestyles needs. Additionally, we are dedicated to providing first-rate customer service and adhering to honest business practices, which is evidenced by our A+ rating with the Better Business Bureau. Wood decking – We offer treated lumber, our most affordable option, and lower maintenance premium cedar decking, both which have a natural appearance and can be stained and sealed. Synthetic decking – Customers can choose from a PVC cellular option that is plastic throughout the product or Tamko Envision® PVC coated composite decking, both which are easy to maintain, exceptionally durable, and resistant to cracking, staining, splintering, fading, discoloration, and mold and mildew build up. 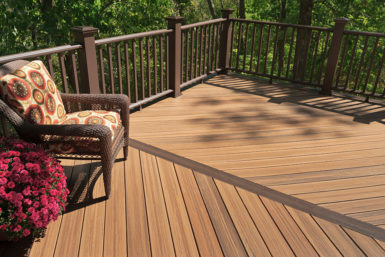 No matter what decking option that homeowners choose for their deck building project, they can rest assured that it will be installed by experienced technicians with the utmost care and precision and backed by a three-year labor warranty. We will even pass along any manufacturers’ warranties, including a 20-year warranty from Tamko that covers fading, staining, and discoloration on their Envision® PVC coated composite decking. Contact Chesley Fence & Deck today to learn about why you should choose us for your next deck building project. We proudly serve all residents of Glen Carbon, IL and nearby cities. Thanks for finishing the fence in time for the pups to visit! Great job!